Are people so consumed with collecting that they’ll drag blistered feet through antique stalls or hunker over a hot keyboard for hours to scroll through watch fobs, pickle dishes, or campaign buttons to find the pièce de résistance to complete their collection? Indeed they will. You’ll know them by the pallor of their skin, and the tiny computer monitors reflected in their pupils. I used to scoff at those silly fools…until I became one. A zombie from The Walking Dead is tame compared to a gimlet-eyed ebay master trolling cyberspace 3:00 a.m.
Like most collectors my acquisitions were gradual and accidental. Then one day I woke up and realized “ooooh, I love these.” Not to be confused with hoarders, who give equal importance to everything, collectors are inexplicably drawn to something they first find interesting, soon find fascinating, and eventually find tugging at their heartstrings. 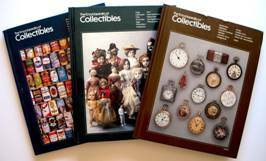 There are as many stories about why people collect as there are collectors. For me, the roll of the dice landed on handkerchiefs. My mother was a handkerchief person. Although Kleenex was the standard, mom always had a freshly laundered hankie in her purse. 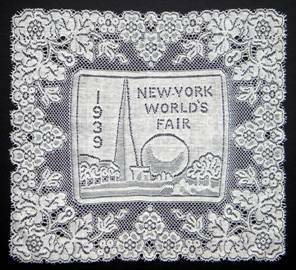 I’ve always carried a hankie, and decades ago began gifting a handkerchief, often monogrammed in pale blue, to a bride on her wedding day. 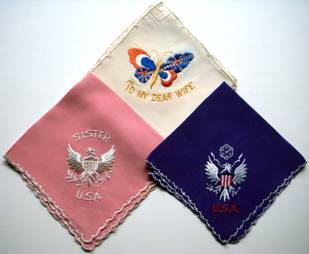 I soon began collecting wedding handkerchiefs I found particularly beautiful, with the hope I was gifting an heirloom keepsake. 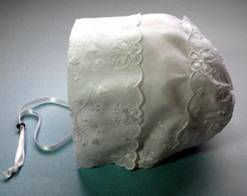 When I discovered the bridal hankie/baby bonnet tradition, I was hooked. I began creating christening bonnets, which can be fashioned without any cutting or compromise to the handkerchief’s integrity. Upon reaching adulthood, the bonnet is disassembled and used as wedding handkerchief when the child becomes a bride. 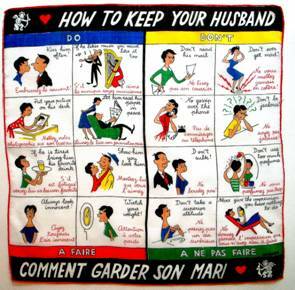 (If the baby is male, the hankie is gifted to his fiancée.) Note the embroidered butterflies adorning the border, which symbolize new beginnings. 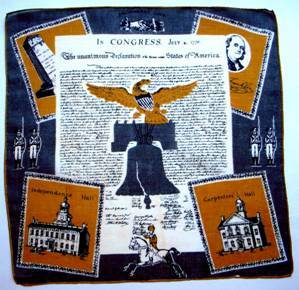 People soon began sharing their handkerchief stories at weddings and christenings, and my interest quickly expanded to encompass all manner of hankies. 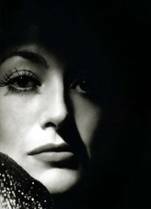 I learned how Hollywood silver screen legend Joan Crawford was responsible for creating the lipstick handkerchief, making it the fashion “must have” accessory overnight. 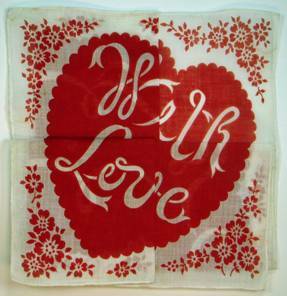 I discovered ‘Secret Love’ hankies with messages of passion hidden in their folds. 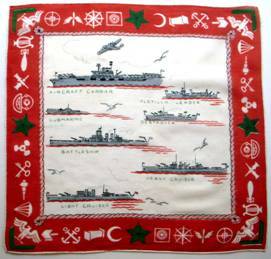 I was particularly drawn to handkerchiefs from WWI and WWII, including silk escape maps and waterproof tide tables, and spoke about them on D-Day to audiences at the Marines Memorial. Handkerchiefs have been with us in the small moments – wrapping a child’s cut finger, catching a tear while watching An Affair to Remember for the umpteenth time, as well as the major moments – a bride’s tears of joy, a widow’s deep sorrow, a marine tucking his wife’s perfumed hankie over his heart. 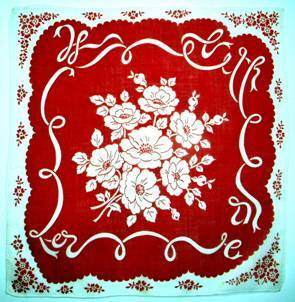 Handkerchiefs reached a pinnacle of production in the 1930’s and 1940’s due to the depression as well as WWII. Unable to afford new clothing, women lifted their spirits and brightened their wardrobe by adding a colorful handkerchief. They came in floral patterns, geometrics, embroidered, screen printed and more. 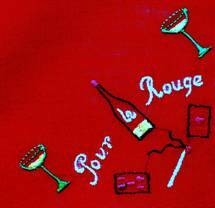 You’ll also find holiday themed hankies – Christmas, Easter, Valentine’s Day, birthdays, etc. as they were often the only gift people could afford. They were used to teach lessons to children, (note how the “slow but steady” turtle is #1) as well as lessons from history. 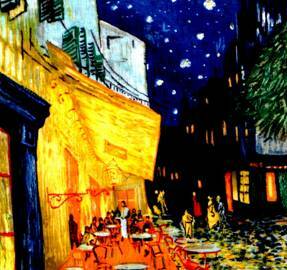 They represented fond memories of once-in-a-lifetime journeys, and replicated artist’s masterpieces. 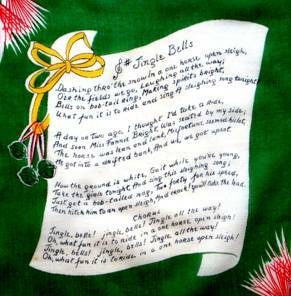 They bore lyrics to a favorite Christmas carol, as well as instructions for new brides. 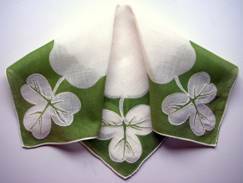 Handkerchiefs symbolize romance, journeys taken, landmark occasions, holidays, celebrations, and special memories. Unlike electronic communication, they don’t need to be re-charged. They can be worn next to your heart, tucked under a pillow for sweet dreams, carry a lover’s perfume, and if treasured, can last a lifetime. I consider them heroes because as delicate as they are, many have survived 100 years or more. Many of mine are at least 70 years old. They were saved because they were loved. As I explained to a friend – I’m on a search and rescue mission to save these little heroes of history. 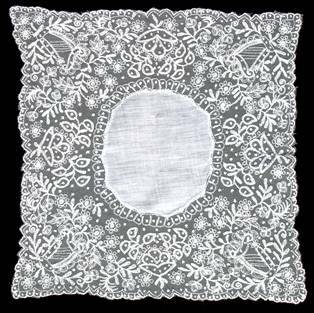 Limerick Lace wedding handkerchief resplendent with good luck shamrocks and Celtic harps. As an accidental collector, my wish for you is that you too find that special something that brings an involuntary smile to your lips, or puts a catch in your throat, and you have the opportunity to share it with someone who holds a special place in your heart. Would love to know the computer program you’ve installed. I assume it’s some sort of database like Access or Filemaker Pro. something that syncs w/photos sounds terrific. It’s a tremendous amount of work and any tips or tricks you could share would be appreciated by us all I’m sure. Thank yo so much for writing in. When you say all alone in your collecting, I understand, but we’re out there, I assure you. 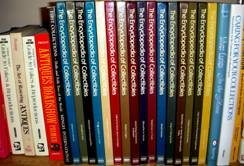 Also, as I’m sure you’re aware, there are perhaps a dozen books I’m aware of focused on handkerchiefs. A few (one Italian, one on children’s vintage handkerchiefs) include historical background. Some are craft related, others are photographs of collections and a few are like catalogs, grouped by subject matter and giving the current value (current as of the publication date, as many have skyrocketed in price.) I have my own idea for a book as well. Would love to hear from you and others as to how you display your collection. That might make an interesting blog topic. Thank you for writing in. I didn’t know there was such a thing so I’m afraid I can’t help you. Perhaps one of our readers will chime in. 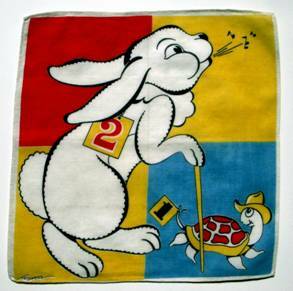 Please can you tell me the collective name for a handkerchief collector. I’m unaware of any such moniker. Perhaps our readers can help? Thank you for a great explanation, one I will repeat to myself when collecting starts to feel like a hoarding! WOW! I think we may be hankie twins! Uh oh. I know a wonderful woman who puts weeks of work and love into handkerchief quilts which she then gifts to people. Many have themes in their subject matter or colors, so we all have our own way of “saving” handkerchiefs for future generations.